Evoke a sense of poise and grandeur with Barbour's Embleton watch, styled with a subtle impression of Tartan leather print, leading to a luxurious rose gold plated case. The dial, crown and hands are also rose gold coloured, giving a subtle radiance over the black dial. Wear in the evening as a striking style statement. With 120 years of iconic motorcycling fashion history, Barbour's unique British values and functionality seamlessly transfer to their elegant watches. 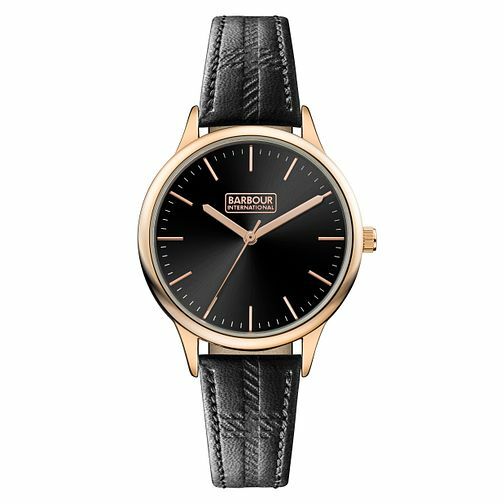 Barbour Embleton Ladies' Rose Gold Plated Black Strap Watch is rated 5.0 out of 5 by 1. Rated 5 out of 5 by Anonymous from Lovely clear face, good watch Very happy with the watch style look and feel. Great for my outdoor lifestyle.